Jack Driscoll practiced journalism with the same innate decency that he practiced ordinary life. When I got out of school, the chief editors at the first two newspapers I worked at were kind of nuts. They fit the stereotype of the hard-charging, maniacal editors familiar from movies and TV. They yelled, they screamed, they threw things. Their style of leadership engendered fear more than loyalty, and their focus was relentlessly short-term: get the story at all costs. Jack Driscoll was nothing like that. When I got to the Globe, it didn’t seem possible that he could be the big cheese in the corner office. He didn’t yell. He didn’t kick over waste baskets. He treated everybody — the star reporter, the middle-aged secretary, the guy from Jamaica who emptied the waste baskets — the same way, with dignity and respect. He could be tough. Jack Driscoll was no shrinking violet. But he practiced journalism with the same innate decency that he practiced ordinary life. He blew up that stereotype in the wider, popular culture, that you had to be a belligerent hothead to hold politicians and the powerful accountable. He didn’t have to be a hard guy or a loudmouth because he knew there was nothing harder, or louder, than an inarguable fact. And it worked, for nearly 40 years at the Globe, seven of them as the Globe’s top editor. He was a Melrose guy, and he knew New England in general and Boston in particular because he was of these places. Perhaps because he lived in a house surrounded by smart, accomplished women, Jack Driscoll championed women in our business long before it was fashionable. When Jack was a senior but not the chief editor, a secretary at the Globe named Eileen McNamara asked to be made a reporter. Despite Jack’s lobbying, the Globe took a pass, so he helped her land a job at UPI. Luckily, McNamara didn’t hold a grudge, because she came back to the Globe and had a great career, winning a Pulitzer Prize in commentary. Jack had a great eye for talent and brought an amazing number of the Globe’s best to Morrissey Boulevard. He also knew how to retain talent and grow it. He urged his secretary, Kathi Mullin, to try out for the copy desk. When he found out one of the paper’s best young journalists, Linda Matchan, was from Canada and might have to leave the country, he helped get her a green card. When David Arnold, then a graphic designer, tried to resign so he could get a job at which he could learn to write, Jack tossed the resignation letter and found a training program for Arnold, who went on to become a terrific reporter and deft writer for the Globe. Tom Mulvoy, another quiet, ultracompetent and inherently decent newsroom leader, said Jack Driscoll loved journalism but loved the people who practiced it more. In 1988, as the Spotlight Team prepared to publish a series on then-Senate President William Bulger and his gangster brother James “Whitey” Bulger, the special agent in charge of the FBI called Driscoll to dispute the bombshell in that series: that the FBI wouldn’t target Whitey Bulger because it was using him as an informant. The head of the FBI said the story wasn’t true. Driscoll sat down with Gerry O’Neill, the Spotlight editor, who assured Driscoll the story was true and listed all the sources confirming its accuracy. “The story went in the paper as written, and Boston’s underworld, even the city itself, was changed forever,” Kurkjian said. 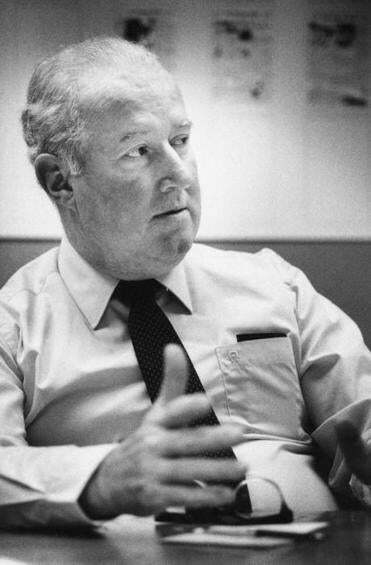 Long after he left the Globe in 1993, Jack continued to work in journalism, at MIT, and elsewhere, and he continued to write encouraging notes to reporters, those he influenced, and those he just admired from afar. Age can be cruel, and Jack Driscoll’s body began to fail him, but his mind never did. Last summer, on a sun-splashed day, he was sitting on the deck of his house in Rye, N.H., having lunch with two of his favorite Globe alums, Eileen McNamara and Bella English. They talked about the news of the day and the subject of children being separated from their parents at the southern border came up. Jack Driscoll put his lobster roll down and said this: that if he were still running a newspaper, he would run a box on the front page with the number of migrant children separated from their parents every day until they were all reunited. Jack Driscoll died Tuesday. He is survived by his four daughters, his seven grandchildren, and his steadfast belief in the inherent power of facts and the genuine decency of most people.